This eagle tried to steal catfish from anglers on Lost Island Lake and got tangled in their line. The anglers were able to untangle the line from the eagle and then she just sat on shore. They contacted Palo Alto County Conservation who picked up and provided overnight housing. 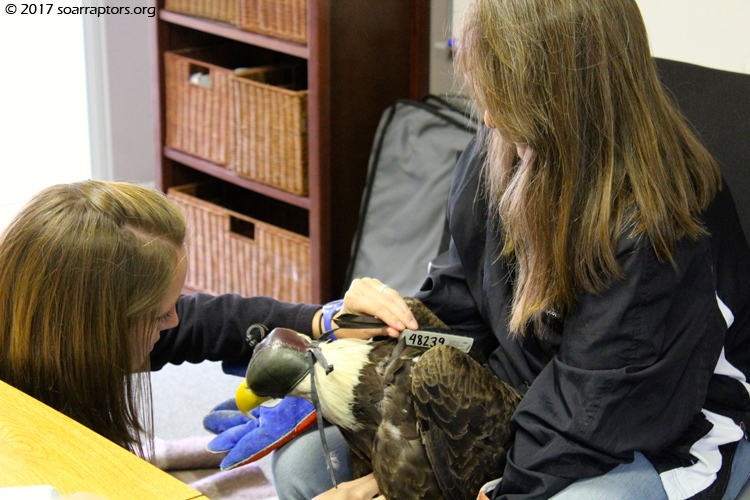 The Iowa DNR Warden in the county transported the eagle to Kay. 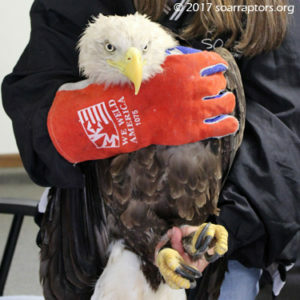 The eagle was absolutely emaciated at 7.25 lbs. We quickly learned that this eagle had a federal band and a transmitter. Then we learned that this eagle was in rehab at the Grey Snow Eagle House in Oklahoma and released early June 2017. Eating three skinned quail per day. Per request of Sara and Trish who coordinate telemetry units for several research projects, Kay removed the transmitter and returned to Sara. Oklahoma now weighs 9 lbs. Oklahoma was weighed one last time and is now 10 lbs, and loaded into crate for transport to meet Sara Schmuecker, FWS, to get transmitter back on. Our best guess on what got her down only one month from being released from rehab in Oklahoma is a bout of West Nile Virus. This virus is flu-like in symptoms and an eagle that doesn't feel well for several days in a row will not have energy to hunt and will loose weight. Listen to this “In-Depth” Radio segment with Dr Bob Leonard from KNIA / KLRS Radio in Knoxville, Iowa as he talks with SOAR friend Marla, Kay Neumann, and Sara Schmuecker about the eagle release on 27 September 2017. Please note the info Sara shares about the importance of the telemetry research being conducted. Sara Schmuecker, FWS, attaches the telemetry unit to Oklahoma on 27 September 2017 just prior to release.